The $10 million Qualcomm XPrize is for a“Star Trek like” medical tricorder. Would this have occurred without Star Trek? Though I am not sure to the answer, I do know that science fiction is where new invention inspires reality. Science fiction has storytelling at its core, we have utilized these stories and the gadgets within for templates of the future. Writers of Science Fiction have been able to tap some stream of consciousness to come, in the incredibly rich veins of creation they mine and bring forth. Amongst those in the public are the scientists, who have an interest in these inventions, and I am sure young Star Trek fans were greatly influenced by what they saw each week. Clearly there is a crossover effect for science, fiction and fact. “Snow Crash” has been cited as an inspiration for Second Life itself. Pointedly story telling is more than entertainment, it is the free imagining which leads to actualization which will carry an audience along with you. We are still Human version 1.0 and a story that has resonance is not just one with a lot of flashy effects. Traditional media tells us the story in movie or TV format where we watch passively, video games today allow us to play within the games' story. (Star Wars The Old Republic game released on Dec 22nd last year, had over 60 million in-game hours played within its first week— roughly equivalent to watching all six Star Wars movies over 4 million times. ) The narrative structure is however tightly drawn, and players are forced to work within the game designers story, which granted, works for many. Surely these players utilize the available assets and create their own interpretations of the future they are playing a part in. The Imperial Agent in SWTOR will have to acquire new skills and equipment to help them combat the ever-growing threat to the Empire, and they have to think fast and employ weapons as fast as they can. This is no leisurely adventure: action and reflexes are the demands of this kind of game. The player is involved with the technology in new and yes highly immersive ways, but there is no originality here and no “what if. There are no shoulders of giants upon which to stand within a game like this. Your success depends on how fast and accurately you can work those buttons. The question becomes: Do you play someone else's story? Or do you originate your own? When the story teller becomes the story participant, the narrative is taken to another level through that immersion. The authenticity of the story is irrefutable when you are living it, not waiting for the next game prompt. In World of Warcraft though you pick your lineage, you are somewhat freer within it. And another MMO of note HabboHotel with over 225 million registered users, allows neither scripting nor asset creation, but you are welcome to freely form your activities with what is available. What you don't have is the greater collective of millions of people who can build what they want. For this you really do have to go to Second Life. This is where new fiction will meet the virtual road and the first person story becomes the multi person story and eventually, the event. 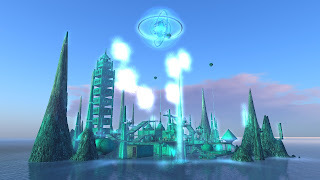 Science fiction role play is significant in Second Life, with spaceships, starbases, and a plethora of accessories available. As you can customize your look, author your role play and your storyline, the eventual enterprise which grows out of this stands an excellent chance of becoming where new invention takes place. Within virtual worlds, new ideas also infuse our minds with imaginary and fantastic invention. And these ideas are taken further, and form the seeds of reality not only as it will come to be but as it is now! While I am one person and can think of a lot, I am only one person, with you there is twice as much, and with a legion of people enterprising and playing,we can think of that much more. Our intelligence has demands placed upon it by others who expect a retort or answer as we play in real time with them. This is beyond suspending our belief – we are willingly immersing ourselves in a new story which we grow and evolve daily. This is is so different from traditional sit back and relax media. This is tips of your fingers, edge of your seat engagement. For those of us involved, other kinds of games pale. And here is why Second Life isn't really a game. Its a life-story told against the backdrop of a million different user creations. Just like when you walk down the street- it is the creation of many different hands, not just one Lead Art Director. This living story we are telling one another is vital to the history of ourselves. Being active participants in something we can experience beyond the “mere mortalness' of our daily and present lives. Powerful stuff, and I do look to this plane to create the new invention and discovery, because it is what we are doing with a marketplace of amazing inventions and items that I would bet will be seen in the physical world over the next 20 years or sooner. And I also imagine a kind of Gedankenkuche (thought kitchen) of the future as well. Not only is this a place for people to create their stories, but also where actual scientists are talking. This is the platform for development of the future, while we can now utilize full media within this environment – where we can invite scientists to sit across from a virtual table, actual location unimportant and even use Wolframs Alpha on a prim to cross fertilize ideas. That is really the science fiction of the future, where scientists can discuss ideas in real time with no limits and then, even see their visions actualized in 3D. What kind of stories will these be? Ones I suspect which lead one day to documentaries. Where this is the home of the future for thought leaders who can utilize not only real time interaction, video, film and more for problem solving, but the great resource which is one another. .
Word - Up is the part of The 1st Question where our esteemed panel contributes to the lexicon with their own originals. Taking off on a new buzzword, next year's trending word, (as I see it) provided the title for a recent article in MediaPost. Science and technology are intertwined with animation and magic. In 1936, Walt Disney patented the Art of Animation - using the Multiplane Camera in a way that allowed animators to reuse backgrounds and other unchanged portions of an animated film. This improved the quality of the finished film as well as cut time and cost. In 1938 while watching a Mickey Mouse cartoon, belief becomes easily suspended, because that B & W image is nothing like the life one experiences once the lights go up. In 1970 -Lilliane Schwartz debuted Pixellation one of the first digitally created films to be shown as a work of art. She worked early in her career with Bell Laboratories, developing mixtures of sound, video, and art. In 1978, Mickey would get his star on the Hollywood Walk of Fame. Ask anyone you know who their favorite cartoon character is and they will have an answer for you, possibly more than one. Cartoons and animation are a part of our lives, our visual entertainment, our early identity and frame of reference. Animation had become so widely accepted that in 2001, the Academy of Motion Picture Arts and Sciences introduced a new Academy Award for Best Animated Feature. The rise of animation has also entered our living rooms in full force with video games that people play. At no time more so than now, do people get behind an avatar, literally and figuratively to spend hours inhabiting a character. 60 million+ hours have been spent playing Star Wars The New Republic since it's release this Dec 20th. It is a staggering amount of time. According to the Entertainment Software Association’s (ESA) 2011 Essential Facts About the Computer and Video Game Industry, 72 percent of American households now play video games. The average gamer is 37 years old and has been playing for 12 years. It's a good demographic. The ability to be in the cartoon and run the action has become a mode for many, all you need to earn that passport is an avatar. While we embody our avatars, giving them greater or lesser powers than we have on the other side of the small screen, we ask to be cartoonified in order to join in the activity. A few years ago VodaPhone created “animated videos” of ZooZoo's – this was an ad campaign developed by Ogilvy & Mather to convey different value added services offered by the mobile phone company. The videos while they look animated, are made with people wearing costumes to look this way. http://youtu.be/Stc8G6RfCKY Why wear a costume though? Why not be a cartoon? Consider this as a definite trend for video as we reach into the new year. Since YouTube's inception an amazing number of hours of video have been watched, and every year there is a Top Ten list. This year 2011, for the first time a cartoon has entered not only the Top Ten but the top 5. Nyan is a video game character that flies while you score for eating healthy foods. (That the cat has a pop-tart body should be an alert to Kellogg.) This might be the Nexus of game culture, cartoons and video. The rise of inexpensive to produce engines such as Xtranormal, Stupeflix, or GoAnimate allows new technology to give rise to animation at the press of a button. It doesn't allow for spectacular graphics, needs good writing to make an impact, and shows a new direction in inexpensive animation platforms. Whether your avatar is having fun or function is up to you – when you begin recording that avatar in your virtual world or game, then you are becoming a part of a story and able to do or be a part of the grandeur that was Rome, the middle ages, or the far or near distant future. Being part of the story, embodying this is another way of extending who we are. And because these worlds exist so do the platform or structure within which to be filmed. The game engine platforms of video games and virtual worlds allows a 360 degree view of various and more diverse environments. They are ones we become more adept in, and active in through our time there. These scenes and environments will move more into the forefront of commercial activity as virtual assets also continue to grow. It allows marketing departments to take chances, and to offer something very special for small cost. This is a good example of game engine graphics coming of age. And if someone wanted to start selling those Xtranormal teddy bears next Christmas on Amazon, I think there would be a market for them.